Another trick that is simple to do, the Upside Down £5 Note Trick reminds the audience once more that the magician is the keeper of secret and special knowledge. Perhaps in reference to a wager or just for fun, the magician borrows a note from a mate and announces that he is going to demonstrate his mastery over illusion with it. Holding the note out for inspection, the audience confirms it is a normal note and then the magician folds it in half. Again and again the magician folds the note until it is a neat little package. As he begins to unfold the note the magician explains that the magic was done already, when they first inspected the note they thought it was right side up, but - as the last fold is undone - the note is clearly upside down. Knowing the right folds and how to hold the note allow the magician to perform the Upside Down £5 Note Trick. Any normal folding money will work. The Upside Down £5 Note Trick is a perfect trick to perform at a moment’s notice and can be done anywhere and in front of any audience. It is a “light” trick, more fun than mysterious. Holding the note out with both hands, the magician allows it to be inspected and proven to be a normal note. Folding the note in half lengthways, the magician makes the first fold towards himself. The magician can make this as simple or dramatic as he wishes, but should use some patter; “Top over bottom” he could say. 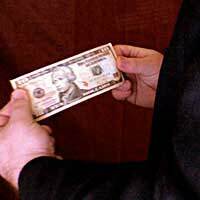 If the magician wishes to perform this trick with the face of the note towards the audience, he would perform the moves in reverse. The first move would have the top of the note folded down away from the body, etc. The magician should perform this version of the trick in front of a mirror to make sure of what the audience will see. This trick is a great way to offer a light hearted, even silly introduction into an entire money magic routine.